Essay series, part VII: What is distinctive about the way that Orthodox Theologians conceive of their task with reference to the work of Elisabeth Behr-Sigel. “Elisabeth Behr-Sigel’s work “has constantly involved constructive dialogue with Western theological trends… and has also been at the forefront of renewed thinking in the past twenty years on questions of gender.”1 She thought that grappling with the role of women in the church was key to the success or failure of the ecumenical movement and that Orthodoxy had an important role to play in reinterpreting the Tradition and exposing falsified dogma. She goes on to make a careful distinction between what the Church Fathers said about Scripture, and what the Church Fathers said about their own context. The former Behr-Sigel takes as authoritative, the latter she takes with greater latitude: for it is not the Church Fathers on their own in which the Tradition resides, but the Church Father’s interpretation and application of Scripture in Sobornost. Behr-Sigel receives the biblical principles first observed by the early Church Fathers, that Scripture instructs us to believe men and women are equal in essence, in their humanity, and in their capacity for God. Then she asks: How does that now play out in our culture, as opposed to theirs? This opens up a new way of faithfulness to the Tradition. The work of Elisabeth Behr-Sigel demonstrates the unique contribution that Orthodox theology has to offer in the twentieth and twenty-first century theological debates. In a century where old borderlines eroded with the cultural and intellectual end of the Modern era, Orthodoxy has become a constructive critical voice for a Western hermeneutic. This influence is summarised by the unique understanding of Tradition as the voice of the Holy Spirit in the Church. But underlying this beautiful simplicity lies a distinct intellectual heritage – non-dualistic, Trinitarian, spiritual and discerned through the practice of prayer and worship. Essay series, part VI: What is distinctive about the way that Orthodox Theologians conceive of their task with reference to the work of Elisabeth Behr-Sigel. Essay series, part V: What is distinctive about the way that Orthodox Theologians conceive of their task with reference to the work of Elisabeth Behr-Sigel. This pattern of community, personalism and mystery in theology flow outward from it’s Trinitarian core to dominate the Orthodox theological agenda. For example, Behr-Sigel’s vision for an inclusive church is “in the mind of our God, One in three persons: a community, or rather a communion of persons in his likeness, men and women ineffably different but equal in dignity, free and responsible, under the inspiration of the Holy Spirit.”3 In other words, distinction within the Trinity cannot be forced to their extremes – we must stay in the apophatic realm lest our arrogance results in heresy for claiming too much. Analogously, we must hold lightly to distinctions between gender, lest we lose the primary emphasis on all humanity created in the image and returning to the Triune God. Essay series, part IV: What is distinctive about the way that Orthodox Theologians conceive of their task with reference to the work of Elisabeth Behr-Sigel. Essay series, part III: What is distinctive about the way that Orthodox Theologians conceive of their task, with reference to the work of Elisabeth Behr-Sigel. It is a spirituality which reflects a different theological journey through the centuries than the Western Churches have trod and directs our attention to another important distinction of Orthodoxy Theology: it’s undergirding hermeneutic and epistemology. Essay series, part II: What is distinctive about the way Orthodox theologians conceive of their task, with reference to the writing of Elisabeth Behr-Sigel. Embracing this challenge, Behr-Sigel is hopeful that the unique contribution of Orthodox theology in the contemporary world might be, as French Orthodox theologian Olivier Clement put it, “the overcoming of modernism from the inside.” They note a parallel between the ‘anguished self-questioning’ (Clement) and “the meaninglessness of life that undergird a seeming frenzy of living” (Behr-Sigel) with the redemptive discovery of the kenosis of a loving God 7. I’ve just handed in a ‘Reading Reports’ assignment where I had to summarise and respond to various set texts in order to grasp something of the global trends in theology in the twentieth century. It may be a bit clunky, but I’ve cut and paste the assignment here to give you a paragraph on some key theologians from the past 100 years. Several of the chapters set in these reviews are from the fat brick of a book that is the subject’s text: David Ford’s The Modern Theologians. Final post in this series of assignment reading. The Binns article draws back a little to map the development of Orthodox Theology across the centuries. 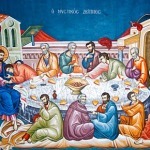 In so doing he demonstrates the unique way in which Orthodoxy prioritorises Tradition – the practice, worship, wisdom and fellowship of the Church in corporate discernment of Truth. “It is almost true to say that the Holy Spirit, the Christian Church, and the Tradition are phrases which refer to the same reality and, in practice, mean the same” (p.61). In the nineteenth century this is expressed by Khomiakov in the Russian term Sobornost, and, as illustrated above, sums up the impenetratable connection between theology and the Tradition. “True authority lies in the whole body of the Church bound together in love, rather than in the hiercharcy of the bishops or the teaching of the Scripture” (p.67). Hence, the ecumenical councils of the church become a model for doing theology, the guidance of the saints, particularly the Church Fathers, indispensible and the maintenance of historical continuity in the liturgy essential. Over the years of the Ottomon Empire leadership of the Orthodox Theological Tradition gradually moved to Russia. In the twentieth century both Soviet Socialism and Russian Orthodox Theology have been profoundly influencial on world religion (p.86). “If Marxism had its roots in Christianity, then much modern Orthodox theology has its historical roots in Marxism” (p.87). Theologians exiled in the West have provided a unique opportunity for a new ecumenism engaging with innovations of twentieth century Continental philosophy, particularly so in the city of Paris. Binns summarizes the contemporary Orthodox focus as the presentation of the Church Fathers in order to interpret their present context (p.92) which again betrays the centrality of Tradition in Orthodox theology and the integration of theology and church practice, especially liturgy and prayer. More dancing around the library! Let’s distinguish between big T Tradition and little t tradition – the former is that category of theological authority that has something to do with the Church’s interpretation of truth across the centuries. Little t tradition are the little groups and discourses of church practices and beliefs that are somehow distinctive – i.e. the protestant tradition, the pentecostal tradition, the Orthodox tradition. Orthodox theology assumes that big T Tradition is indispensable to right interpretation of truth. That’s because the Holy Spirit is the teacher of all truth and the Holy Spirit resides in the Church, therefore, where the universal Church agrees on an interpretation of Scripture – it must be true! Love it!! !